Have you ever fumbled through your medicine cabinet, bleary eyed, late at night, searching for a fever reducer or pain reliever? I can relate! My own medicine cabinet used to be a mess – things were overcrowded, difficult to find, and half the medicine was expired. To solve the problem, I came up with this easy-to-maintain system for my own home. 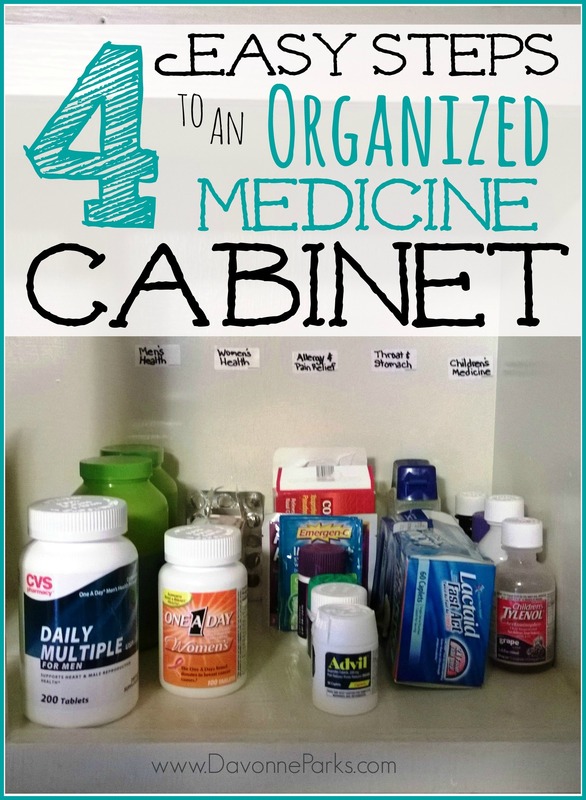 I want to share my system with you today in hopes that it’ll inspire you to take a few minutes this week to organize your own medicine cabinet! 1) Circle expiration dates with a sharpie. Take the time to check expiration dates on all of your vitamins and medicine. Properly dispose of old medicine and use a sharpie to circle the expiration dates on all medicine and vitamins that you’re keeping. The black circle makes is so easy to see if your child’s Tylenol has become expired the next time he or she gets a sudden fever. 2) Organize medicine by person or by type of medication. We include vitamins with our other medicine. Your categories may need to be different than mine, but having your medicine categorized will help you to quickly find what you need. 3) Use sandwich or snack bags. If any medicine tends to fall out of its package or to leak, put it inside a zip-top sandwich bag! I do this with our sore throat drops and it keeps them from falling out all over the cabinet. 4) Label the organized categories. Since ease-of-use is a must for having a good organizational system that lasts, take a few minutes to label each category with food labels or with masking tape and a sharpie. This way anyone in your family can find the medicine they need to find and can put it back easily as well. And that’s it – if you follow these four simple steps, you’ll have an organized medicine cabinet that will serve your family well over the upcoming fall and winter months! Personal Thought/Application Question: Do you have any tips you’d like to add about medicine cabinet organization? « 4 Easy Steps to a Decluttered Kindle!